MANILA, October 28, 2009 The defense of the Catholic Church’s doctrines on family and life remains a critical issue of debate in a liberal generation we have at the present, but Frank and Geraldine Padilla vowed to continue working for the renewal of family and defense of life no matter how tough it gets. 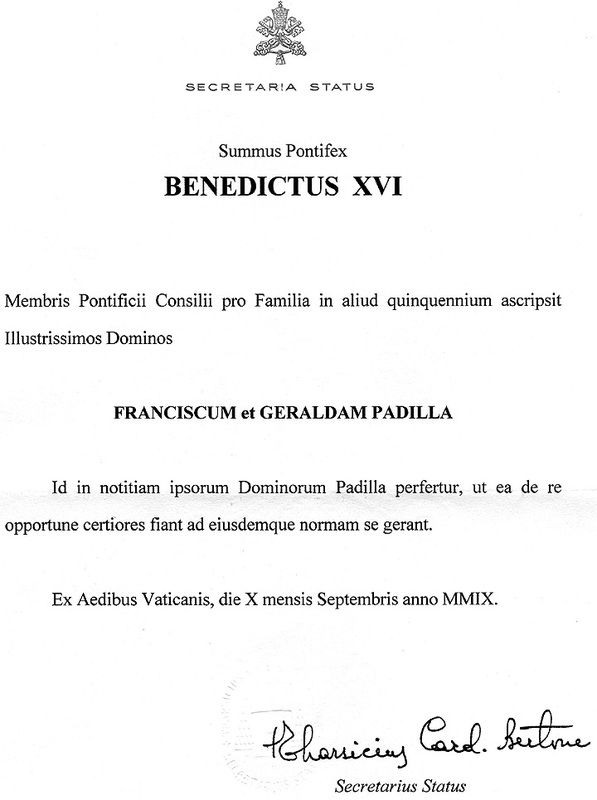 After having been re-appointed by Pope Benedict XVI to the Pontifical Council for the Family, the Padillas admitted that they are facing truckload of works to do with the Council given the numerous attacks being directed against the Church’s doctrines on family and life. “The tougher challenges come not as a consequence of the reappointment, but the times that we live in, with family and life under greater attack especially from powerful forces including the United States government, the European Union, the United Nations, the liberal media, the homosexualist philosophy etc. It is only the Catholic Church that is actually standing up for marriage, family and life. Thus the Catholic Church is also the object of attack. Family and life are the critical issues of this third millennium,” Frank said. But despite the challenge, the Padillas promised their untiring commitment with the Vatican’s pro-family and pro-life cause, adding that their involvement with the Couples for Foundation for Family and Life will help them fulfill their duties for the Council. “CFC-FFL's mission is the renewal of the family and the defense of life. We are right there in the forefront of the struggle against anti-family and anti-life forces. We are committed to strengthen the family, and build a worldwide network of committed families that will allow the light of Christ to shine forth. So our involvement in CFC-FFL keeps us grounded on what is going on, not just in the Philippines but also throughout the world, and equips us with the approaches and programs that are important for this work,” said Frank, who is con-currently the servant general of CFC-FFL. The Padillas are among the 19 couples appointed from around the globe to the Council. Since their first appointment in 2003, the Padillas are the only Filipino and Asian couple chosen by the Holy Father for a slot in the lineup. But even before their stint at the Vatican, the couple’s advocacy has been always geared towards fidelity. 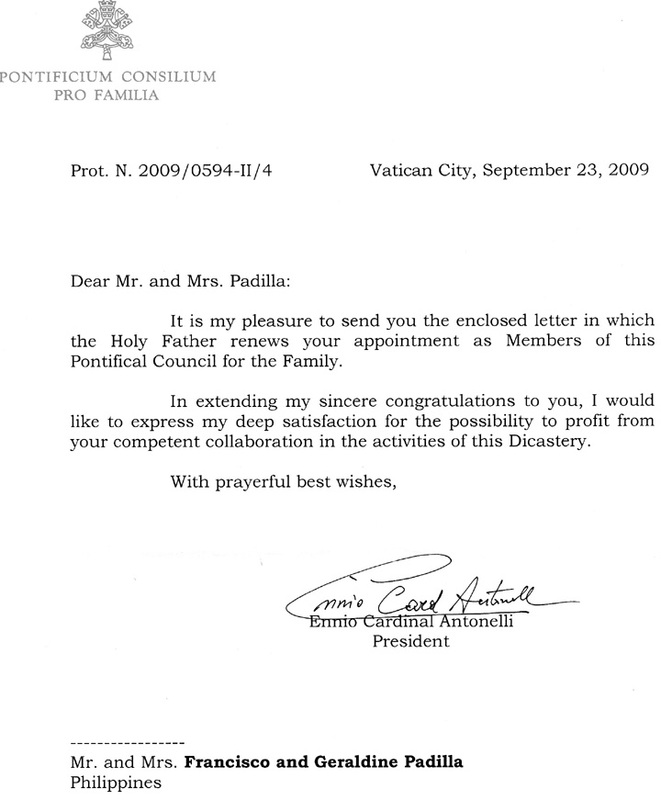 "His Holiness, Pope Benedict XVI, has re-appointed our Servant General Frank Padilla and his wife Gerry as members of the Pontifical Council for the Family, effective September 10, 2009, for another term of five years." This icon has an important connotation and its presence in the VI International Families’ Congress answers the need for looking at the roots of the whole Christian family: the family of Nazareth. This piece of art prevailed in the V Families’ Meeting carried out in Valencia, Spain in 2006. It represents the journey back from Jerusalem, after Jesus was found in the Temple. Saint Joseph carries Jesus on his shoulders, and Jesus is looking at his mother, Virgin Maria. During the journey, Maria delivers the papyrus to him with the words that announce his mission. The text from Isaiah 61,1-2 is written in Greek: “The Lord’s spirit is on me, as he has elected me…”. Saint Joseph’s face reflects the features of Yaweh’s servant “the face of the Holy Shroud”, as a preparation symbol for the mission of God’s servant who carries the world’s sins. VI WORLD FAMILIES MEETING. MEXICO, 2009. The Logo uses human silhouettes, to represent a family born of love which is symbolized by three hearts and sustained by faith which is represented by a cross on top. The cross also represents the presence of God as the One who holds the family together. Christ gives life, strength and light. The three hearts represent a united family, brought together by love and relationship. The family members´ attitude is joy and trust in the Lord. These three elements family, hearts and cross stand on an ellipse that represents the world, seen as a global fraternity. It also represents the family joined by faith and love, which are the foundation of an authentic development of all the human and Christian values, that is to say, an integral personal development, which begins with the family. The family is in the world but transcends it because it lives human and Christian values. The delicately outlined figure of a woman, who is pregnant, points to life, the first fundamental value promoted, defended and cherished by the family. The green color has two meanings, the cheerful hope in the Family’s future and the color of Mexico, where the VI World Families' Meeting will take place. The black and green combination gives the Meeting seriousness, elegance and solemnity as well as a touch of jouthful. Our Servant General, Frank Padilla, together with his wife Gerry, participated in the 6th World Meeting of Families held in Santa Fe, Mexico, on January 14 to 18, 2009. Frank and Gerry are members of the Pontifical Council for the Family, and are the only members from Asia. The 6th WMF was mounted by the Vatican's Pontifical Council for the Family, and brought delegates from 96 countries, including many cardinals, bishops and clergy. Frank and Gerry were among the presentors at the Congress plenary, attended by 9,000 delegates. They spoke on "Couples for Christ in the Renewal of the Family and the Defense of Life." Speaking of the family as teacher of values makes reference to a series of actions that imply a whole process oriented to obtain a definition, a configuration, a firmness and perfection in each person that conform the family, procedures that allow us to reach a greater strength and a better “finish”. It is universally accepted that the human being is molded, especially in the first years of his life, in the bosom of his own family; it is here, where the family plays an irreplaceable role in the formation of the person’s human and Christian personality. The historical moment that we are living shows us how the family has given up its identity and mission to educate the person, with the consequences that we know: relativism, subjectivism, sensualism and lack of values in society. The natural scene for values is daily life. It is very important to understand this genuine scene of family values. Therefore, family life is the profound and stable authentic opportunity, the vast horizon of the most excellent human adventure which is, finally, no other than true, good and beautiful love, as the highest value. Consequently, the family has an important and significant mission: to be teacher of values. • Humanly: The human nature has certain aims, and when they are accomplished, man reaches perfection or his prime. Human nature consists of two elements: one natural and one rational. Values make reference to the totality of the person. Here psychological and sociological aspects fit in. The psychological approach studies, for example, the person’s character (his faculties, his talents, his motivations, etc.) and determines not only how human acts “are”, but how “they must be”. That is to say, a person’s “have to be” is formed. The reflection on values is also “science of social behavior”. In fact, many and diverse social conducts are being formed in the family. Here, the relations of one “I” with another “I” focus on each another, taking into account their dignity as persons. • Spiritually: The human being is a biological and spiritual totality (intelligent and free) that tends to his final aim by means of the harmonic development of his faculties. Therefore, it covers other spheres: The person’s duties relative to his spirit (formation or culture of intelligence and will) and the person’s duties relative to his Creator (interior worship or religion). This subject is related to and continues the theme of the Fifth World Encounter of Families in Valencia, on the education of faith in the Family. If we take into account that today’s Christian has to be a true disciple and missionary in the Church as well as in the world, our topic is directly related to the theme of the Fifth General Conference of the Latin American Episcopal Council in Aparecida: the family also understood as teacher of Disciples and Missionaries.